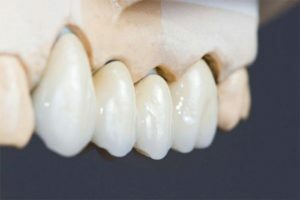 A dental bridge is a traditional tooth replacement therapy that features a porcelain crown (what is essentially a false tooth) suspended between two functional crowns. The crowns on each end are anchored onto healthy teeth adjacent to the area of a missing tooth. With a bridge, you can replace one or two teeth at a time. If you are having a bridge made to rest on dental implants, you can replace up to 3 or 4 teeth at once (because implants, rather than natural teeth, support the prosthesis). Our dental bridges usually take two appointments to complete. During your first visit, Dr. Sekhon will adjust the adjacent teeth to receive crowns and take an impression of them. After your custom bridge is made, we will have you return about 2 weeks later to try it out. If everything fits properly, we will use a permanent cement to bond the bridge into place. After having a tooth extracted, it’s best to preserve spacing by replacing the tooth as soon as possible. Items like a water flosser or tufted floss may come in handy for cleaning underneath your bridge. Talk with one of our dental hygienists for more recommendations on getting the most out of your bridge. Learn about all of your tooth replacement options when you schedule an appointment with Dr. Sekhon. A dental bridge could be your solution to a complete, functional and beautiful smile! Call our practice today to plan your visit. All treatment is provided by a general dentist. For more complex cases, we often refer our patients to a specialist for treatment.